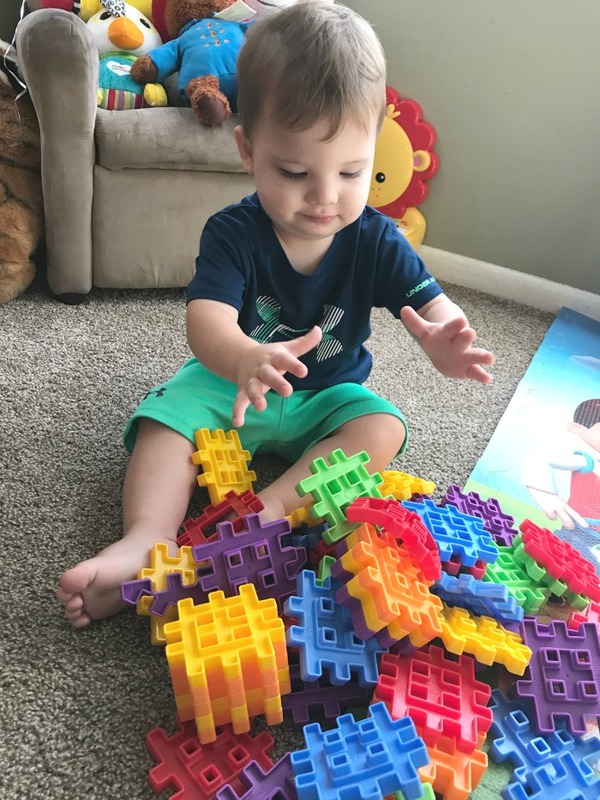 My son Caleb LOVES the Little Tikes Waffle Blocks! A few weeks ago Little Tikes sent us a Bag of their waffle blocks to play with and play is what my toddler has done. 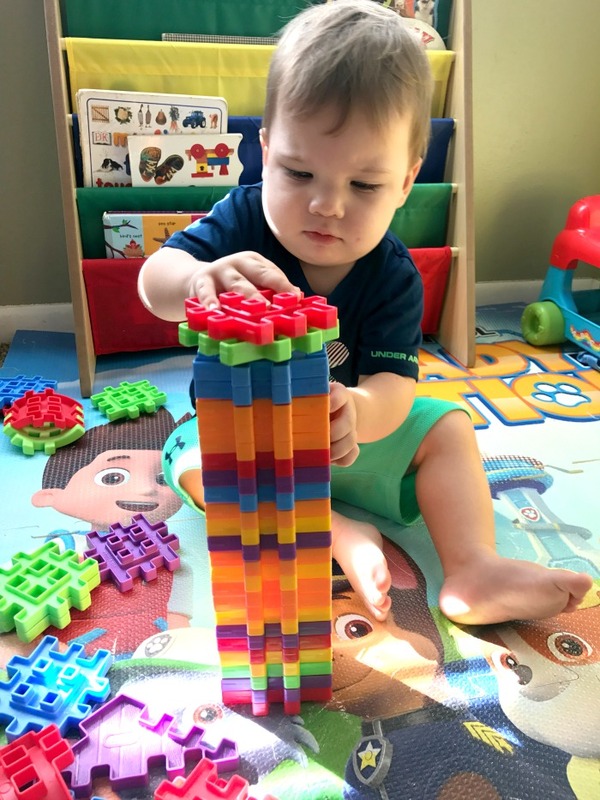 These waffle blocks are the perfect size for little hands and since these blocks can stack together several different ways they aren’t frustrating like some other building blocks can sometimes be. The great thing about the Little Tikes Waffle Blocks is that they come in different shapes and sizes. There are tiny ones and even giant ones for building large things. But since Caleb is just starting to have an interest in building things the Waffle Blocks Bag 60 piece set is perfect for him. Inside this bag comes 60 different waffle blocks. They are 7 different colors of waffle blocks which include: red, blue, purple, green, orange and yellow. Most of the pieces are the same size and shape but there are a few different shapes like a curved waffle block and also a roof which would help in making different structures. Waffle Blocks are The Perfect Toy For Toddlers! I wasn’t really sure if my 18 month old would really play with the waffle blocks before we received them. But as soon as we took them out of the package he has played with them everyday since. He will actually sit there for 10 minutes at a time BY HIMSELF and build things. Any parent with a toddler knows that this is huge. And if his brother or sister is playing with him, he will sit there for much longer. Waffle Blocks are perfect for toddlers. 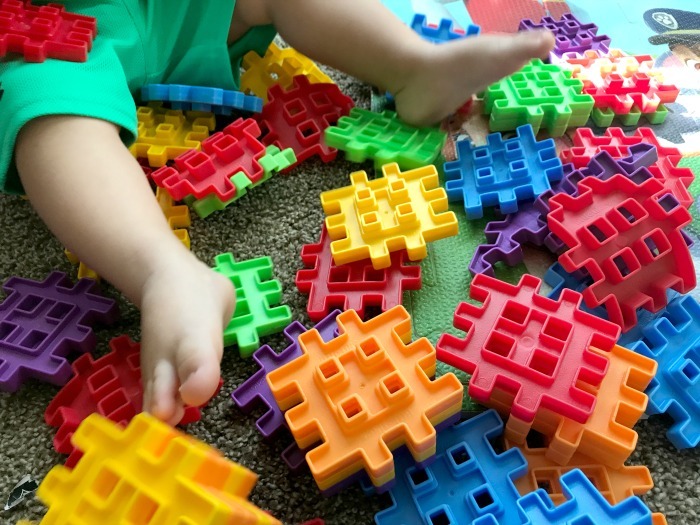 Where Can I Buy Little Tikes Waffle Blocks? 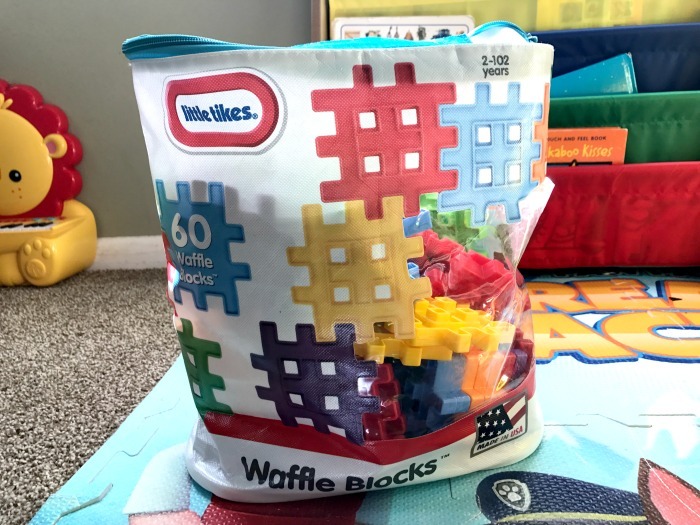 Little Tikes Waffle blocks are sold in stores and online. We have found them in our local Walmart and Toys R Us and also Amazon has a huge variety of Little Tikes Waffle Blocks. You can also purchase them directly from the Little Tikes website. The particular Waffle Blocks bag that I got will run you around $20 right now on Amazon. 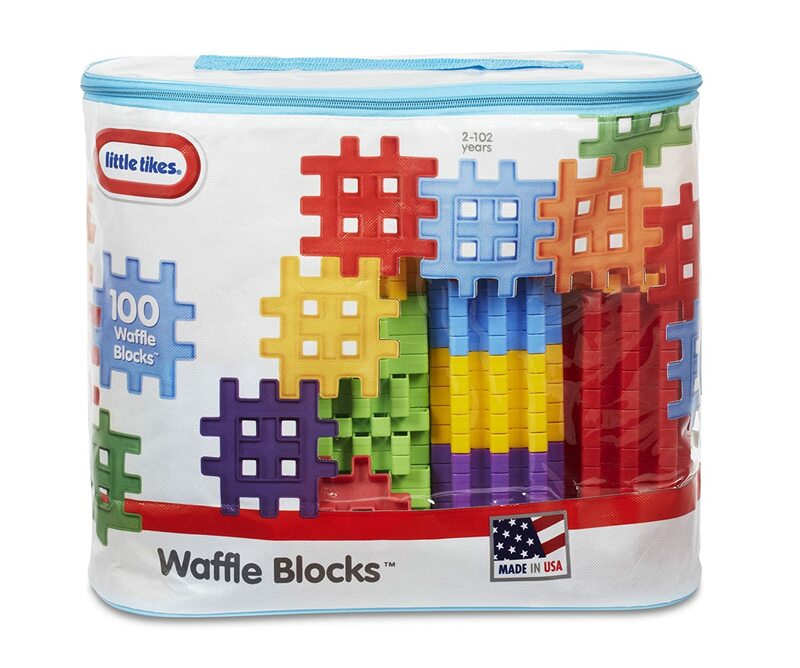 As a mom I love that the Waffle Blocks are easy to pick up and you can store them right in the bag that they come in. It makes for super easy clean up. Especially since Caleb loves to pour out every single waffle block out onto the floor. He loves the colors, the shapes, the texture of the Waffle blocks. We will definitely be getting him more of these fun toys in the future. I think next time we will get the Little Tikes Large waffle blocks. They look like a lot of fun too! We received product in exchange for our honest review. Those look like nice interactive and educational building toys for little children.